Handsome Husband is a big fan of Dean Smith, the basketball coach. With his recent passing there has been lots about him in the news. Handsome Husband was reading an article to me and both of us were struck by this quote from Dean Smith. My photo was taken at Mount Magazine State Park, quote added. 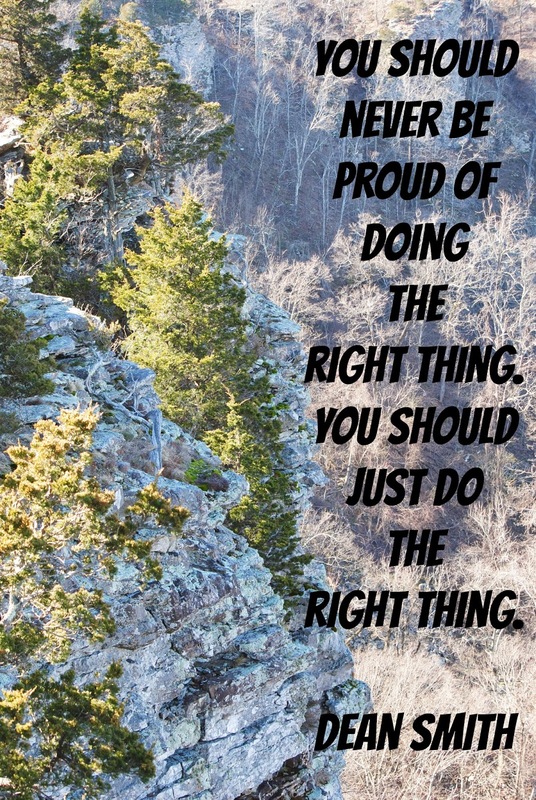 "You should never be proud of doing the right thing. You should just do the right thing." Oh that's a good one! I'm not sure what my favorite is, I'll have to think on that! There is a similar quote that I love, which appears to have been erroneously attributed to Martin Luther King: 'Never, never be afraid to do what's right, especially if the well-being of a person or animal is at stake. Society's punishments are small compared to the wounds we inflict on our soul when we look the other way."